This soft diet is very appropriate for those people who have difficulty in chewing but need complete nutritious food for their body. Pureed meals can give all the necessary nourishment and the person can maintain soft diet. Take a blender with required capacity. Add pork stir fry to the blender. Add ½ cup cooked spaghetti in it. 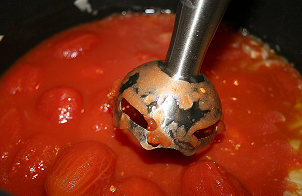 Then add apple juice/ tomato soup and ½ cup water to the blender. Run the blender till the contents get pureed, add more water if required. When you are taking the comfort foods you will not feel tired. This liquefied food is rich in proteins and vitamins. Spaghetti will provide the necessary carbohydrates to make you feel full and to provide the necessary energy. Celery, peppers and beans will provide the necessary fibers to improve the working of the digestive system. You can make necessary changes in the recipe to change the texture and make it suitable for your taste and according to your ability to chew and digest the soft foods. When you want to make your soft food more liquefied, you can add the juices, tomato sauce, milk, or water to it.